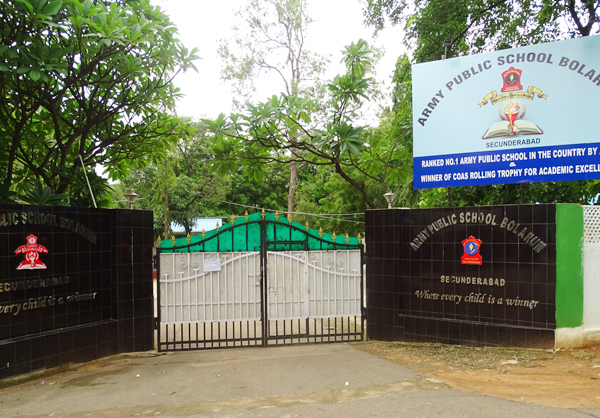 Army Public School Bolarum since its inception on 1 April 2002 as the second Army School in the twin cities of Hyderabad and Secunderabad has been earnestly striving to follow the vision to disseminateÂ Â holistic education. APSB is a Vibrant Centre of learning disseminating holistic education by providing a congenial atmosphere to motivate, educate & inspire young minds fostering ethical, social & moral values through “Holistic Learning” which helps them to bloom into responsible global citizens in future. The School was rechristened as Army Public School Bolarum in the year 2011 and in 2012 the school was upgraded as Higher Secondary School .The school offers three streams i.e., Science, Commerce and humanities at the higher Secondary Level. Eleven different combination of subjects are offered to the students of class XI including Psychology, Informatics Practices and Physical Education. The School which commenced with 19 teachers, 5 administrative staff and 419 students has today grown to 96 teachers, 26 administrative staff and approximately 3000 students. These figures are the testimony of the fact that inspite of its humble start & till date having an humble infrastructure has successfully emerged as a rapidly progressing school. In last 16 years of its eventful journey APSB has succeeded in carving a niche for itself at both state and national level through the dedicated and committed efforts of its staff who passionately work as a team in bringing a sea change in all their students who pass the portals of the School.